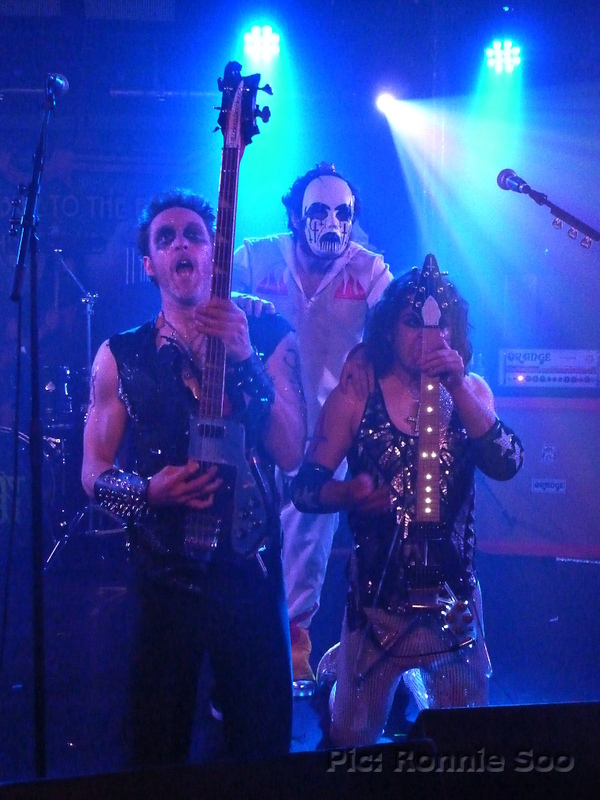 Although this bunch of crazies from New York (correctly billed as ‘Tragedy: All-Metal Tribute To The Bee Gees And Beyond’) have been around for several years now, having hit upon the genius idea of giving classic disco hits a Heavy Metal twist, this was the first time I’d seen them live. Playing in the downstairs part of the o2 Academy, it appeared to be another ‘throw ’em in’ setup with the bar and merchandise side sectioned off, and it was an almost empty venue I entered. As a result it was an empty barrier, and I’d wanted to get in early in order to catch support Bigfoot, a hotly-tipped quintet hailing from Wigan. By the time the Bigfoot lads got on stage the place had filled somewhat, suggesting a lot had come along to see these guys. They were performing with a stand-in drummer, for reasons I couldn’t quite catch, and from my spot on the front I was actually struggling to hear vocalist Ant Ellis. The sound mix was a little bit bass-heavy (not for the first time in this venue!) and that did take the edge off their performance. The guitars (courtesy of axemen Sam Millar and Mick McCullagh) still cut through with some tasty leads from both, and the depping drummer was both powerful and showy but it was still dominated by Matt Avery’s bass. From what I could make out, what they bring to the table is familiar enough, but for a band that’s still new to the scene, they gave an accomplished performance. I’d like to see these guys again soon, and with luck the sound mix will give the lads a better shake. The changeover was swift, with several guys in glittery face paint setting up. It was obvious that these were the guys from Tragedy, and I was amused to see that although they’d changed the drums over, they’d left Bigfoot’s kick drum (complete with their logo) in place. I don’t think I’ve ever seen a gig before that saw the headliners play with a support’s bit of kit! When they eventually came on, it was a bunch of blokes clearly well into middle age, clad in the sort of ridiculous silver lame that looked naff even in the 1980s! One of the guitarists even topped off his KISS-inspired look with an inverted crucifix, while the other wore silver shorts with matching boots! Before all of that, a mysterious figure in a white jumpsuit decorated with flame effects on the sleeves and legs wandered through the crowd brandishing a flashing light – this was ‘Lance’, as detailed on the back of his outfit. Not a musician, but he was seen throughout the show as the target for slapstick abuse from the rest of the band! The band opened, naturally enough with their metallic cover of ‘Tragedy’ but from there, the set performed was a lot more varied than I’d anticipated. Covers of the likes of ‘Funky Town’ (Lipps Inc/Pseudo Echo), ‘Maneater’ (Hall and Oates) ‘Little Red Corvette’ (Prince) featured among many others; with Lance appearing on stage regularly to towel down the band members – a running gag being that he was perpetually being batted away by the players! When not doing that, he’d brandish confetti cannons, blasting out coloured ticker tape at frequent intervals. Lance was there mainly as ‘chew toy’, subjected to being thrown around the stage but towards the end, was given a ‘solo spot’ where he ‘played’ along to a blistering guitar solo, while brandishing a pink toy ukelele! Among several amusing points in the set, the guys gave Lance a satanic-ish face mask for their cover of ‘Sweet Caroline’; for this they renamed themselves ‘King NEIL Diamond’ (!) In addition, a recognisable drum beat heralded what appeared to be a cover of Slayer’s ‘Raining Blood’ but, after playing the opening guitar riff to that number, it transformed into a Metal rendition of ‘It’s Raining Men’! Of course they closed proceedings with their take on ‘Staying Alive’ before inviting numerous female members up on stage. The gig was a lot of fun, once again though their sound was swamped a bit much by bass. They’re actually good players, and vocals were taken not just by singer/occasional keyboardist Disco Mountain Man, but by guitarists Mo’Royce Peterson/Garry Bibb and also (prominent!) bassist Andy Gibbous Waning. Again, I’d see these again, but again I’d hope for a better sound balance next time out. A new year and a new venue for IndigoBravo promotions, consisting of two guys based in east Manchester who have done some sterling work in putting on gigs showcasing up and coming bands from across the country and beyond. They had been putting bands on at the Blazing Rag in Mossley, but a change in policy at that place meant a new home was required for 2017. They found it at nearby Stalybridge, located almost next door to Stalybridge train station and with a car park conveniently just across the road, it’s within reasonably easy reach. The pub is rather long and narrow inside, with the bar to the left and the small stage at the back with a staircase leading down to the ‘facilities’ to the right. Consequently, you need to be at the very front to get a good view of the bands. This opening show at the new venue was headlined by Bristol’s iDestroy, a ‘grrrl’ trio featuring vocalist/guitarist Bec Jevons (also of The Blue Aeroplanes, a band I saw at the beginning of the year in Liverpool) plus Becky Baldwin on bass (one of the busiest players on the scene currently; also a member of DORJA and Triaxis), as well as drummer Jenn Haneef. The audience contained some familiar faces to me who’d come from far and wide, which may not necessarily have gone down well with the management as many of us would be driving and therefore on soft drinks! Support was from local band Gdansk81; this band struck me as being strongly influenced by the post-punk sound of Joy Division and towards the end of their set, a cover of that band’s ‘Transmission’ confirmed what I’d thought. They went down well with the punters, but weren’t really my cup of tea. iDestroy however, were. Their music is hard-hitting, short and snappy punky style rock songs with lots of hard guitar riffs and plenty of ‘hey! hey!’ chants from bassist Becky, all held together with Jenn’s heavy drum sound. There’s a lot of energy in each number, and during one song while Bec got the punters to chant back to her, Becky decided to do an Angus-type walkabout onto the floor, a brave move as there was only a narrow avenue for her to walk down while playing her ‘Rickenbecky’ bass. After an enjoyable set of around 45 minutes, including a couple of new songs they took their bows before mingling once more with the punters. A successful opening gig for the IndigoBravo guys then, they have many more acts coming up at this venue over the coming weeks and I will endeavour to get to more as time and money permit. It’s been a busy year for Thunder, British rock stalwarts who have just released their second album since their second reunion and eleventh overall (presumably they didn’t get the memo that bands no longer split up, they just go on ‘extended hiatus’ until they feel like doing something again! ), ‘Rip It Up’. This record comes hot on the heels of their official biography (‘Giving The Game Away’, named after their 1999 album) in which all members past and present contributed to a comprehensive look at their history. In addition to that, singer Danny Bowes has embarked upon a broadcasting career with a weekly radio show on Planet Rock, and has even found time to add vocals to a recent single from fellow UK rock band CATS in SPACE, a cover of Slade’s ‘How Does It Feel’. Given that their 2009 split was down to the workload becoming too much, is there a danger of that happening again? Hopefully not, since their two albums since starting up again in 2014 have been released on the independent earMUSIC label, rather than the band issuing them through their own label as was the case from 2003 to 2009. 2015’s ‘Wonder Days’ album was well-received by their loyal fanbase, with its slightly nostalgic feel it perhaps went down well with long-time listeners who have grown older alongside the guys in the band. At the time of writing this post I am still awaiting my physical copy of the new album (the bundle of LP, CD and bonus EP since you ask) and so it was time to start up Spotify, where the 11 tracks that make up this album are available to listen to immediately. Having given this album a few (virtual) spins now, I have to say it all sounds rather familiar. The guys in the band have spoken in interviews about how they’ve tried to stretch out more this time around, and felt that they did accomplish it with this record, but much of the material immediately had me thinking of tracks from earlier albums that had some kind of similarity. Case in point being ‘She Likes The Cocaine’; a cautionary tale about drug abuse that has a similar sort of wah-wah guitar effect as ‘Everybody’s Laughing’ – another cautionary tale about drug abuse from 2003’s ‘Shooting At The Sun’. All but two of the tracks on this album reminded me of earlier material, and having been a fan of this band from the start, having bought every studio album they’ve released to date, the songwriting style of Luke Morley is now becoming a little too easy to read. The chord progressions are very similar to what’s come before, giving the feel of something we have heard many times over. One slight variation comes on the power ballad ‘Right From the Start’; it is the sort of thing they’ve done many times before but on this occasion is given an extended outro guitar solo from Luke Morley. The best track on the album for me is ‘In Another Life’; even this has a distinct air of familiarity about it though as its slow grooving style will make listeners of ‘a certain age’ think of Alannah Myles and her 1990 hit ‘Black Velvet’. Honestly, if you don’t start singing ‘Mississippi, in the middle of a dry spell’ along to it then you mustn’t know of Ms Myles! The Thunder song does however feature probably the best vocal performance of the entire album by Danny Bowes. Another track that borrows from someone else as opposed to themselves is closing number ‘There’s Always A Loser’, with a drum beat straight out of Zeppelin’s version of Memphis Minnie’s ‘When The Levee Breaks’. I think that the band would benefit from using an occasional outside contributor more; they are almost totally reliant on one songwriter (Morley, other members have contributed sporadically in the past) and once you wise up to his style, his songs all have that familiar feel. Even lyrically – I felt like throttling the speaker at yet another mention of ‘regret’ (there were three, and another of ‘situation’ which crops up many times in his lyrics). It’s almost on a par with Dio’s frequent use of ‘rainbow’ in his lyrics, something that irked even his most devoted fans at times! When the band HAVE used outside writers in the past, it generally worked well – the last album featured a co-write with Lynne Jackaman (‘Black Water’) who incidentally contributes backing vocals on this album, and 2005’s ‘The Magnificent Seventh’ closed out with a track co-written with noted hitmaker Russ Ballard (‘One Fatal Kiss’). They don’t need to do an Aerosmith and bring in the likes of Desmond Child or Diane Warren to write their entire record, just one or two tracks with a different approach would go a long way towards freshening things up. To conclude, if you know this band even in passing, you’ll have a good idea of what to expect here. It’s well played, well produced and superbly sung (of course, they have one of the best in the business at the microphone) but – that nagging feeling of having heard it all before won’t go away. Because of their inherent quality this album shades a fourth inflatable guitar, but if you do buy this album having come to the band fresh, grab any of their first three or ‘Robert Johnston’s Tombstone’ for a better impression of what they’re about.